Back in 1998, M.Night Shyamalan was dubbed the second coming of either Hitchcock or Spielberg. With his well crafted thriller "The Sixth Sense" he restored our faith in what a good horror movie could be and he provided a twist ending that still impresses twenty years and a million spoilers later. He made two more solid films before he tripped with "The Village" and then fell flat on his face with "Lady in the Water". But it took "The Happening" for audiences to laugh him off the screen and write him off for the next decade. Director Jordan Peele was favorably compared to Shyamalan after his clever and very successful "Get Out" showed up two years ago. It also restored our faith in grown up horror stories and had similar kinds of plot twist moments. Peele however has skipped the next phase of the Shyamalan career, a couple of less successful but still credible films, and he has instead taken a dump that makes "The Happening" look like a modern classic. I cannot express how disappointed I was at this film as I was watching it unfold. This is a miscalculation by someone who is clearly talented but did not seem to have anything to say with his next film project. "Get Out" had something to show us about race relations and class in a post Obama world. It was also creepy as hell for the first hour and incredibly intense in the second. 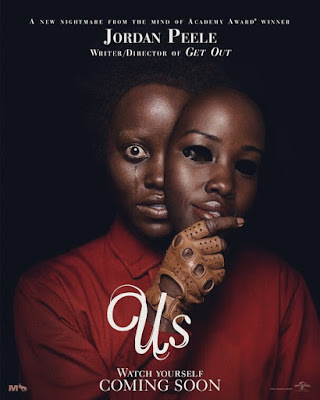 "Us" does not have the benefit of a whole hour of slow burn, it shoots it's wad in the first ten minutes and then never reaches another moment as effectively again. Oh, and the set up that had the brief flash of excitement and fright to it, was not that great in the opening anyway, which made the movie all the less interesting as it went along. If there is some cultural, political or dramatic concept that this movie is trying to make or subvert, it fails on every point. A horror movie can make you laugh at a moment as a release from some tension or thrill that it provides. The catharsis such a moment brings is just what an audience wants. If a horror movie is making you laugh at it's premise and the stupidity of the events in the story, you have a bad horror film. That is what you get with this. If you have seen the trailer, you know that a doppelganger family appears to start a home invasion story with our protagonist family. The moment one of those characters starts to speak I had to suppress a laugh, but when another character starts uttering call back sounds, it not only is guffaw inducing, it is ludicrous. If you are not being terrified by a horror film, why are you watching it? That's the question I started to ask myself along the way. I also asked myself how much worse it could get, and the answer was...a lot. The actors do their best, Lupita Nyong'o in the lead duo role is effective, but her doppelganger character is given some silly exposition to deliver and it is presented in a voice that instead of being frightening, makes you want to get her some Nyquil for her stuffy nose. Winston Duke fairs better but not by much. He fortunately spends less time in the doppelganger role and he also comes the closest to being a real person in the story. He is a goofball of a Dad, which is of course the preferred way to present an adult male in a family these days. He says the wrong thing to calm down his wife, he is a bit of a joke to his kids, and the whole powerboat subplot exits to create a single scene that allows him to have a moment of success by accident. You want to know that you are getting into a bad film that takes itself too seriously, look for an opening scroll that tries to tell you that there is some real idea behind the hoopla. If you think that abandoned subways and tunnels are the lurking places of the bogey man, then maybe you can be convinced that this story is real, HA. Remember how Mark Wahlberg spent an hour running away from the wind in "The Happening"? And do you recall how you laughed out loud when you found out the monsters are the trees? Well that resolution is brilliant compared to the explanation we get here. I have not found rabbits so silly since bugs bunny, and the fear factor in "Monty Python and the Holy Grail" is eons ahead of this. There is of course a final twist that makes everything that came earlier seem even more preposterous. Ouch. Here's one reason I love movies so much. Different points of view. It's funny how different we both see both "Get Out" and "Us". I thought Peele's debut effort felt very much like a first film especially in its messing final act. I loved the crazy, clever, and open-ended approach to "Us". The second viewing opened it up even more. Well believe me, I will not be having a second viewing of Us at least until it is running on one of my premium channels. I was really frustrated by the storytelling here. I know you felt differently, most people do but that's what makes reading these blogs worthwhile, the diversity of opinion.